The first registration found for the farm Brandenburg is that of Joachim Koekemoer on the 26thApril 1753. Seven years later the registration was transferred to Jan Abraham Meyer who later became his son-in-law, upon marrying Anna Catharina Koekemoer, in the church at Tulbach. Meyer also had many other farms in the Bokkeveld and it is unlikely that he lived at Brandenburg. Farmers from around the Piketberg used the Sandveld mostly as grazing land in the winter months. Meyer died two years after his marriage and his widow (who had already buried one husband prior to Meyer), promptly married Joachim Johan Lodewyk Wernich who also farmed in the area. Wernich lived until 1777 and Anna Maria Koekemoer who by this time was a wealthy woman returned to the Cape and married a Mr. von Kamps (after whom Camps Bay is named). After the marriage von Kamps promptly left for Holland leaving his wife behind. 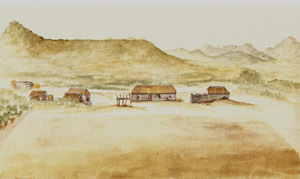 In 1831 the farm was given in perpetual quit rent to Johannes Engelbrecht who in 1796 had married Anna Geertruyda van Zyl (daughter of Hendrik van Zyl and Geertruy Smit at Modderfontein). Johannes died in 1840 leaving Brandenburg to his son Jesaias Johannes and his daughter Anna Geertruyda who was married to Johannes Hendrik Visser. The diagram of the farm indicates that it had a weak permanent spring and probably because of this had to be allowed to be used as an outspan for wagons coming or going to Namakqualand. There are the remains of two old dwellings at Brandenburg. Both T plan and one seeming to be very old. The lower house has the typical Sandveld half-hipped gables, an asymmetric facade with casement windows and a later extension to the left. It is unusual in that the kitchen is at one end of the front range of rooms (rather than in the tail) perhaps indicating that it was originally a two roomed house later converted into a T plan. The interior features heavy squared timber beams and a reed ceiling. The other house also has some casement windows but also features late Victorian sash windows.